Jobless Rate Dips To 8.5 Percent, 200,000 Jobs Added To Payrolls : The Two-Way The unemployment rate is near a three-year low and there were 1.9 million private-sector jobs added to payrolls last year, the Bureau of Labor Statistics says. The nation's unemployment rate edged down to 8.5 percent — its lowest level in nearly three years — as 200,000 jobs were were added to payrolls, the Bureau of Labor Statistics says. We'll add more details from the report and related news shortly, so hit your "refresh" button to see our latest updates. Update at 10:55 a.m. ET. Construction Number Is Particularly Important. "Of all the good news in the December unemployment report, perhaps the most encouraging sign for the 2012 labor market was the increase in construction jobs. That sector has lost more than 2 million jobs as the housing market imploded 5 years ago, but increases in construction hiring and spending could be cautious signs of a turnaround, analysts say." "Today's employment report provides further evidence that the economy is continuing to heal from the worst economic downturn since the Great Depression," White House economic adviser Alan Krueger says on the White House blog. "The monthly employment and unemployment numbers are volatile and employment estimates can be subject to substantial revision. Therefore, as the Administration always stresses, it is important not to read too much into any one monthly report." 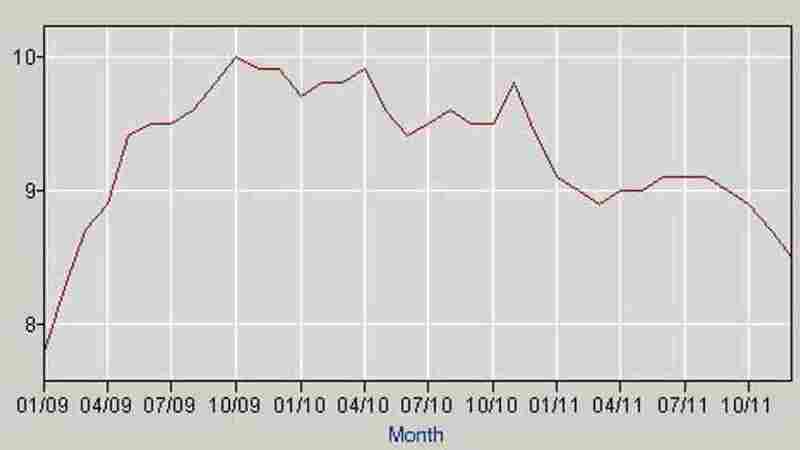 When President Obama took the oath of office, as we said, the economy was officially in recession. 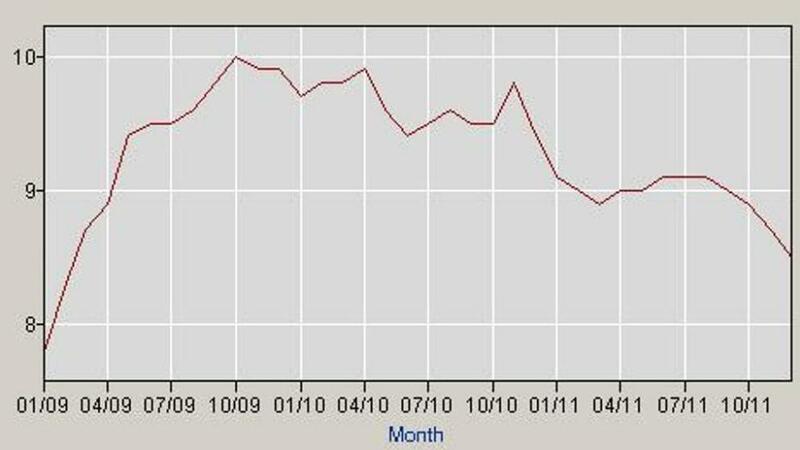 That month (January 2009), private employers had 110,981,000 jobs on their payrolls, BLS says. That figure fell to 106,772,000 in February 2010. Last month, private payroll employment stood at 109,928,000 — 3,156,000 above the February 2010 low but 1,053,000 below January 2009's level. When President Obama took the oath of office, the economy was officially in recession and the nation's jobless rate was 7.8 percent. 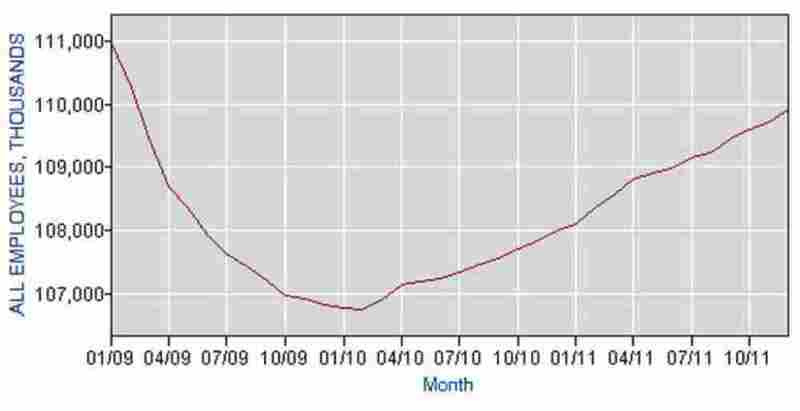 It peaked at 10 percent in October 2009 and stayed near or above 9 percent until late 2011. The nation's jobless rate since President Obama took office. "While it's welcome news that jobs were created last month, millions of Americans still can't find work & small biz is struggling 2 grow/hire," tweets House Majority Leader Eric Cantor (R-Va.). "The number of long-term unemployed (those jobless for 27 weeks or more) was little changed at 5.6 million and accounted for 42.5 percent of the unemployed," BLS says. The number of "discouraged workers" — those who have given up looking for jobs because they don't think there are any to be found — declined from 1.3 million a year earlier to 945,000 in December, BLS says. At 8.5 percent, the jobless rate is the lowest since February 2009's 8.3 percent. Update at 8:40 a.m. ET. Where The Jobs Were. "Employment in transportation and warehousing rose sharply in December (+50,000). Almost all of the gain occurred in the couriers and messengers industry (+42,000); seasonal hiring was particularly strong in December. "Retail trade continued to add jobs in December, with a gain of 28,000. Employment in the industry has increased by 240,000 over the past 12 months. "In December, manufacturing employment expanded by 23,000." All those figures are "seasonally adjusted" to hopefully account for expected changes and better reflect the underlying trends. "Over the past 12 months," BLS says, "nonfarm payroll employment has risen by 1.6 million. Employment in the private sector rose by 212,000 in December and by 1.9 million over the year." Update at 8:36 a.m. ET. Slight Revision To November Rate: BLS says the unemployment rate dipped from a revised 8.7 percent in November (earlier, BLS had said the November jobless rate was 8.6 percent).